The European Union (EU) has defined various standards to protect human health against pollution by ozone, including: information threshold, alert threshold, and long-term objective (LTO). During summer 2014, concentrations of ground-level ozone significantly exceeded these standards. However, the number of exceedances was lower than in many previous years, continuing the long-term downward trend observed over the last 25 years. The first standard, information threshold (whereby a 1 hour concentration of 180 μg/m3 triggers an obligation to inform the population on possible risks), was exceeded at approximately 9% of all stations providing data. The alert threshold (which is triggered when a 1 hour concentration exceeds 240 μg/m3 and requires countries to take immediate action) was exceeded only 4 times. The long-term objective (LTO, i.e. the maximum daily 8-hour mean concentration of ozone should not exceed 120 μg/m3) was exceeded in almost all Member States and in 81% of all reporting stations. Ozone concentrations higher than the information threshold were reported from monitoring sites in 16 EU Member States and two non-member countries. No exceedances were reported from Andorra, Bulgaria, Croatia, Estonia, Finland, Ireland, Lichtenstein, Lithuania, Romania, Serbia, Slovenia and Sweden in summer 2014. The information threshold was exceeded at approximately 9% of all stations providing data. Only one station in southern France and one in central Spain reported exceedances of the information threshold on more than five days. The most of exceedances occurred during June and July, which respectively accounted for approximately 41% and 40% of all observed information threshold exceedances. Ozone concentrations higher than the alert threshold were reported on four occasions. They occurred only in France (mainly in southern France) at four different locations. June and July accounted for, respectively, 75% and 25% of alert threshold exceedances. A maximum 1-hour ozone concentration of 305 μg/m3 was reported from Berre l'Etang, southern France, on 11 June 2014. Note: Only stations with known metadata relating to the ozone type of station are depicted. LTO was exceeded in all reporting countries except Croatia, Estonia, Ireland, Romania and Serbia. Approximately 81% of all the reporting stations recorded at least one exceedance during the summer period. The maximum number of exceedance days per country was 150 (out of a maximum of 183 days) in Spain. On average, those stations observing at least one LTO exceedance reported a total of 11 days of exceedance. The maximum number of 63 exceedance days was observed at the station Villanueva del Arzobispo in Spain. 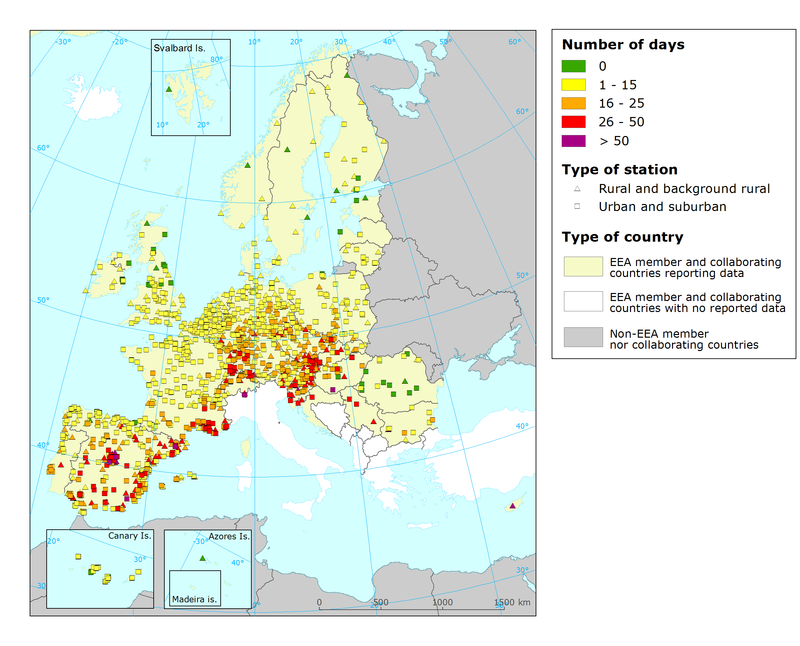 During summer 2014, more than 25 LTO exceedances occurred at stations in 7 EU Member States (Austria, Cyprus, France, Germany, Hungary, Luxembourg, and Spain). More than 25 LTO exceedances occurred at 6% of all reporting stations. This corresponded to approximately 1.1% of the area assessed, affecting approximately 1.0% of the total population. The 2012 TV (averaged for 2012-2014) could be calculated for all Member States (except Greece, Italy and Malta) and 3 other countries (Norway, Serbia and Switzerland). Only stations for which the number of LTO exceedances was available for all three summers of 2012–2014 were considered. This calculation is made only for information purposes. 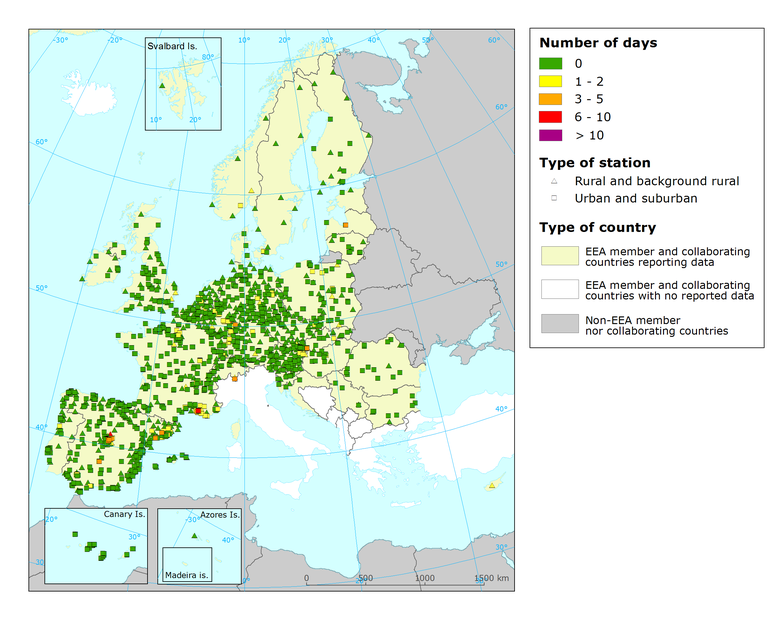 From a total of 2 280 stations reporting data from at least one year in 2012, 2013 and 2014, only 1 491 (65%) could be used for the 2012 TV calculation. Of these, 179 stations (12%) had exceedances of the TV. The 2012 TV was exceeded in 14 reporting EU Member States (Austria, Bulgaria, Croatia, Cyprus, the Czech Republic, France, Germany, Hungary, Luxembourg, Poland, Portugal, Slovakia, Slovenia and Spain) and in two of the other reporting countries with enough data in the three years period (Serbia and Switzerland). Map 3: Number of days on which the 2012 target value for the protection of human health was exceeded (summers of 2012, 2013 and 2014). Note: Only stations with known metadata relating to the ozone type of station in Airbase are depicted. An 'ozone episode' is defined as 'a period of usually a few days up to two to three weeks with high ozone concentrations, characterised by daily exceedances of the thresholds set to protect human health. Ozone episodes occur under specific meteorological conditions characterised by large stagnant areas of high pressure. Since the formation of ozone requires sunlight, ozone episodes mainly occur during summer. Summer 2014 was characterised by very few exceedances with only several days with increased concentrations. One of these episodes occurred between 7 and 14 June, during which approximately 36% of the total number of exceedances of the information threshold, 75% of exceedances of the alert threshold, and 20% of LTO exceedances experienced during the summer took place. Ozone (O3) is a 'secondary' pollutant formed from gases such as nitrogen oxides (NOX) and volatile organic compounds (VOCs) in the presence of solar light. Ozone levels typically become particularly high in regions where considerable emissions of these gases combine with stagnant meteorological conditions, high levels of solar radiation and high temperatures during the summer. Summer refers to the period from April to September. Exposure to high O3 concentrations can cause breathing problems, trigger asthma, reduce lung function and cause lung diseases. target value (TV): LTO should not be exceeded on more than 25 days per calendar year, averaged over 3 years. For description purposes a target value threshold (TVt) is also considered: LTO should not be exceeded on more than 25 days in a calendar year (instead of over the 3 year average). Until 2014, Member States had to officially report on the summer ozone exceedances of these thresholds. Based on this past reporting, the European Environment Agency (EEA) has published annual Technical Reports analysing the summer ozone situation across Europe. After the entry into force of new EU rules for reporting air quality information (EU, 2011) a new system for reporting data was established. For the first time the analysis of the summer 2014 period was based on this new system. 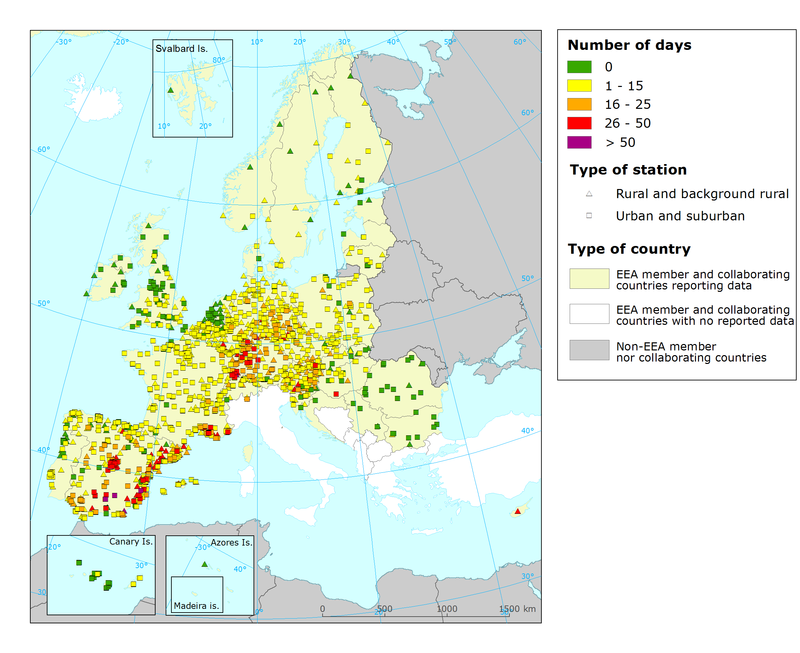 In total, 1 607 ozone-monitoring sites reported data; of these, 1 562 were located in EU Member States. EU, 2008, Directive 2008/50/EC of the European Parliament and of the Council of 21 May 2008 on ambient air quality and cleaner air for Europe. EU, 2011, Commission Implementing Decision 2011/850/EU laying down rules for Directive 2004/107/EC and 2008/50/EC of the European Parliament and of the Council as regards the reciprocal exchange of information and reporting on ambient air. This analysis contains summary information based on voluntary real time data. The information describing the situation during summer 2014 is based on non-validated 1-hour monitoring data and should therefore be considered preliminary. Summer ozone concentrations for 2013 were also provisional at the time of writing. All available data, regardless of time coverage, are considered. 1-hour exceedances are counted on a daily basis, i.e. each day on which a station records ozone levels above the information or alert threshold for at least one hour is counted as one exceedance. The spatial coverage is incomplete: only 25 EU Member States (excluding Greece, Italy and Malta) and five other countries (Andorra, Liechtenstein, Norway, Serbia and Switzerland) submitted data. The analysis is limited only to this area. The absence of data from the Mediterranean countries is significant and may have an influence on the overall conclusions. Nevertheless, in summer 2014 in the countries reporting data, including Spain and Portugal, there were less areas where exceedances were measured. In addition, ozone levels were lower than in previous years. For references, please go to https://www.eea.europa.eu/themes/air/ozone/air-pollution-by-ozone-across or scan the QR code.